A Historical Look at the C&O's Paint Creek Branch and Handley Yard. 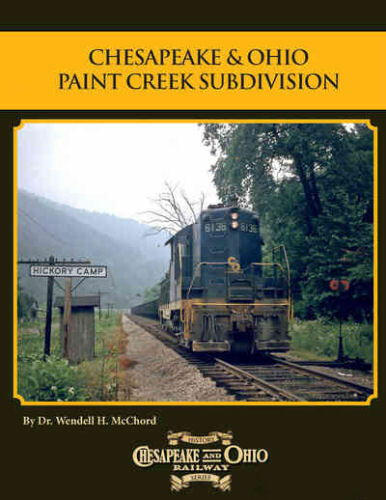 The book has lots of pictures and covers such subjects as: Settling along Paint Creek, Settling the mouth of Paint Creek at Pratt and Hansford, Discovery of Cannel Coal. The early broad gauge railway up Paint Creek. The establishment of Handley Yard and its expansion over the years. The narrow gauge railway up Paint Creek. Building the branch to Kingston by the C&O. The 1912/13 Mine War and the Bull Moose Special Motive power on the branch line The 1932 Flood on Paint Creek. Company towns and passenger stops on the branch line. Passenger service on the Paint Creek Branch from beginning to end. Paint Creek and the West Virginia Turnpike. Competition from the county road. Soft cover.